Very easy to install.. would recommend getting the no cut brackets just to fix sway. This is a good kit, easy to install and looks great. The only thing is I suggest you buy a sway bar kit to eliminate the body roll at highway speed. If you don't have a factory sway bar you will also need a Endlink kit as well. I recommend the Hellwig 7709 rear sway and the hellwig 7961 8-11 endlink kit. Moes: Rich, the Belltech drop kit comes with the shorter swaybar end links, so you would not need to purchase those separate. 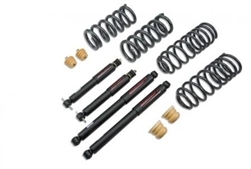 If you purchase this kit and do not have a factory swaybar, be sure to hang on to those shorter links that come in the kit so that you don't have to buy new ones if/when you add the Hellwig swaybar down the road.